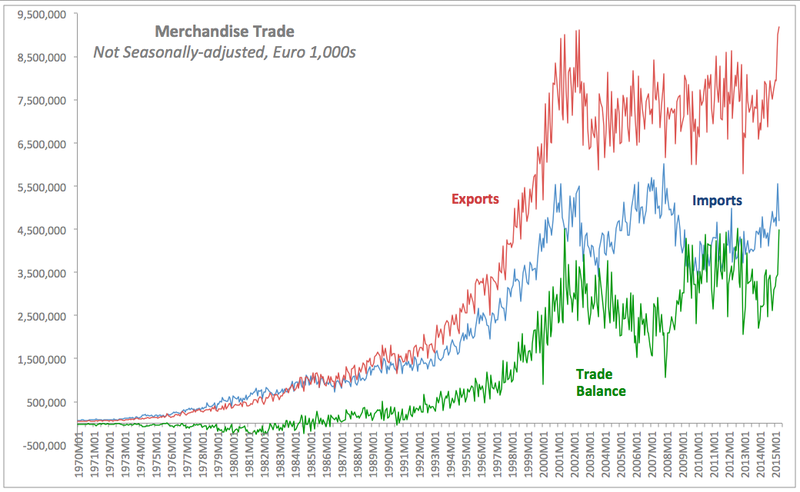 This year, we had some pretty darn bizarre stats coming out of the Irish data on exports of goods. April was no exception. Irish exports of goods have risen to EUR9,813 million in April 2015, up 30.08% y/y having previously posted an increase of 20.10% y/y in March. Over 3 months through April 2015, exports of goods were up cumulatively 22.4% y/y. 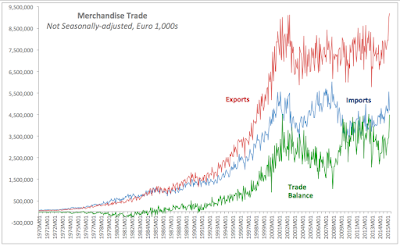 April 2015 saw the highest monthly volume of exports of goods from Ireland on record. Irish trade surplus for goods trade only shot up 62.33% y/y in April to EUR4,484.1 million - the third highest monthly surplus on record. In March, trade surplus was up 27.60% y/y and over the 3mo through April 2015, trade surplus rose 38.2% y/y. 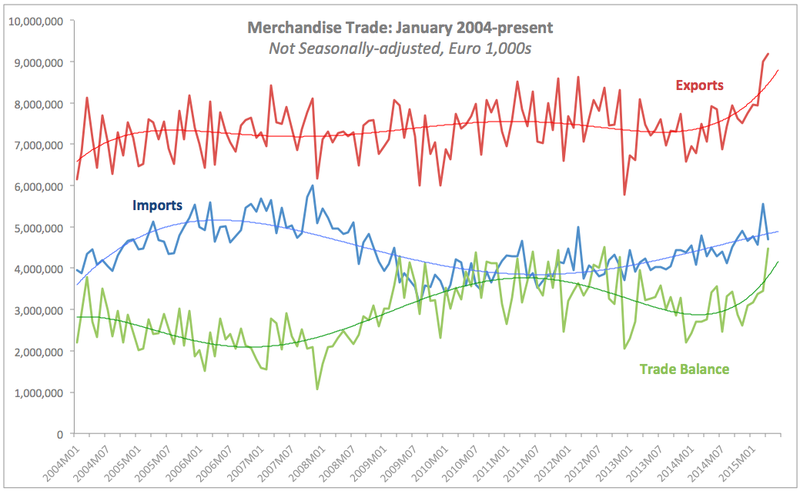 These numbers are simply not reflective of real economic activity in Ireland and are so heavily polluted by tax optimisation schemes and correlated exchange rates effects, there is little point of talking any more about our 'exporting' economy. The CSO breaks down (or attempts to explain) some of the farce as follows: "The main driver behind the April 2015 increase was the increase in the exports of Medical and pharmaceutical products of €1,056 million (+63%) to €2,727 million. The exports of Organic chemicals also increased by €560 million (+40%) in April." On an unadjusted basis: "During April 2015 imports of Chemicals and related products increased by €234 million (+25%) to €1,179 million and imports of Miscellaneous manufactured articles increased by €137 million (+28%) to €628 million. 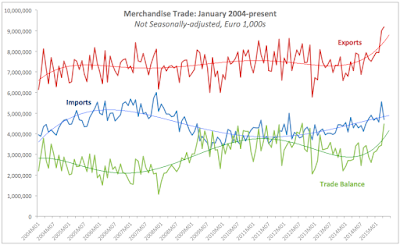 Imports of Machinery specialised for particular industries also increased in April by 86% to €225 million." You have to laugh here: having created no new serious additional production capacity of any note over the last 12 months, we have rises in output to the tune of 25%-plus. If this wasn't a miracle economy of MNCs, we would be world-beating, record-holding economy for productivity growth, richer than Switzerland and Norway, combined. But do keep in mind, employment in pharma sector has been effectively stagnant for years, just as output of the sector is booming at exponential rates.